Tempering Chocolate is a process necessary to ensure that your chocolate candy is firm on the outside, has a beautiful finish, and a nice crisp snap! Tempered chocolate will give your coated candies a dark, shiny, firm surface when they harden. People often write in and ask how they can get their chocolate "shiny" and this is the answer. This process of tempering works equally well with white chocolate, so if you prefer the taste and look, feel free to temper white chocolate, too. The secret to tempering is to never let the chocolate reach a temperature greater than 115 degrees Fahrenheit. In fact, whether or not your are tempering your chocolate, you don't want the chocolate to get hotter than that temperature if you can avoid it. Chocolate "burns" so easily and the texture changes as a result. You don't want that to happen, even if you're an amateur and simply melting your chocolate for dipping, molding, etc. 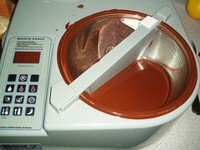 If you are serious about candy making and plan to get involved in more than casual candy making, you may want to consider investing in a decent tempering machine, like the one at Candyland Crafts. I haven't gone that far yet, but if I ever decide to start selling my own chocolates, I will definitely consider it. Here are some (hopefully) easy-to-follow instructions for making tempered chocolate. Be sure water does not touch the bottom of the upper pan. Bring the melted chocolate to 105 degrees Fahrenheit on your candy thermometer or just slightly higher. Remove double boiler from the hot water and place on a dry towel or a cooling rack. Stir in the rest of the chocolate. Stir constantly until it is completely melted. Pour the melted chocolate on a cooling surface, like a pastry marble or even a cookie sheet. Scrape and stir with a metal spatula or pastry scraper until the chocolate cools down to about 82° F.
Reheat back up to 88-90°F. (31-32 C.) for dark chocolate with no milk content and 86-88°F. (30-31 C.) for milk chocolate. If you want to give that a try, go for it, and let us know how you do! Create your masterpiece! :) Use the tempered chocolate for your chosen recipe. You need to keep your chocolate at its proper temperature throughout the candy making process. Monitor the chocolate to keep the temperature right until your delicious work is done. 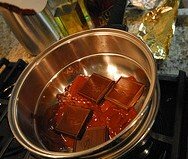 Place the tempered chocolate over a pan of warm water about 2 degrees hotter than your chocolate. Place your pan of chocolate on a heating pad on low temperature. Stir the chocolate occasionally while you are working with it, to keep the chocolate on the sides from cooling and going out of temper before you finish using it. Tempering chocolate does take extra time, but you will be very pleased with the quality of your finished candies. They will be absolutely beautiful! Enjoy!